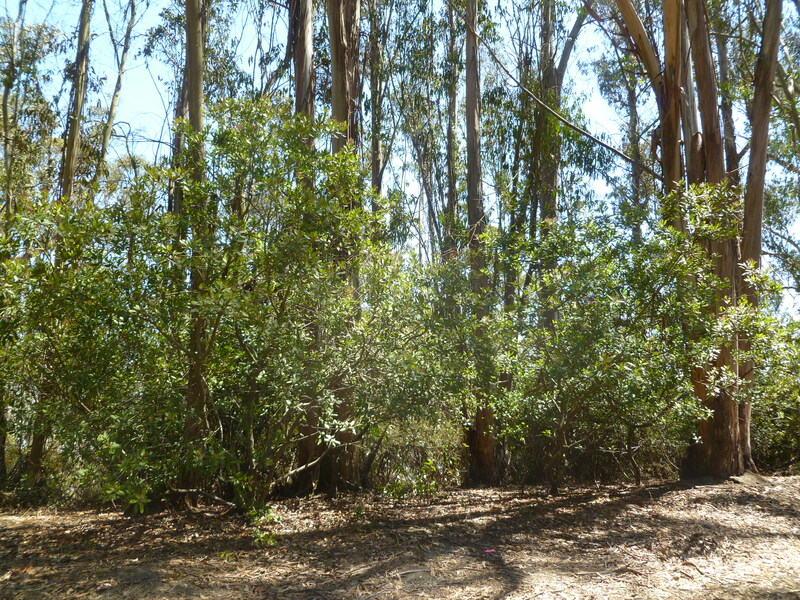 In this post we will continue to critique the assessment of the California Invasive Plant Council (Cal-IPC) that Blue Gum eucalyptus (Eucalyptus globulus) is invasive. One of the arguments that Cal-IPC used to reach this conclusion is that chemicals in the leaves of eucalyptus suppress the germination of native plant species: “[E. globulus] inhibits germination and growth of native plant species.” This property is called allelopathy. This unpublished master’s degree thesis does not prove that eucalyptus leaf extracts inhibit growth of native plants. The study uses two different methods to test the hypothesis that eucalyptus leaf extracts inhibit growth of native plants. In the first method, the seeds of three native species (two bunch grasses and a perennial forb) were germinated in petri dishes in sand soaked with a solution of the masticated leaves of eucalyptus and oak. Two of the species of seeds grew shorter roots in the eucalyptus solution than in the oak solution. The third species of seed grew longer roots in the eucalyptus solution than in the oak solution. The percent of germination was lower in the eucalyptus solution than in the oak solution for two of three of the species of seeds and the same in the third species of seed. Finally, the understory of the dense eucalyptus forest on Mount Sutro is the richest understory we have personally witnessed. Its understory is composed of both native (most notably elderberry) and non-native species. 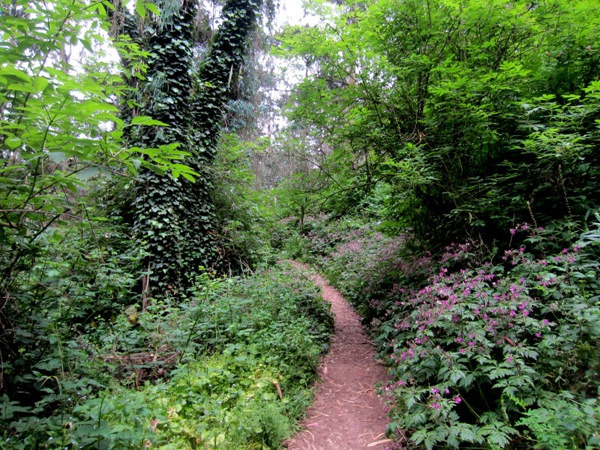 The lush, green understory on Mount Sutro. Courtesy Save Sutro Forest. We give the last word on the scientific question of the allelopathic properties of eucalyptus to R.G. Florence of the Department of Forestry at The Australian National University. An Australian scientist is not under the same pressure to find a negative story to tell about eucalyptus. Professor Florence reports that a world survey of 3,000 articles about allelopathy found “…that the phenomenon of direct chemical interaction in natural communities, in the face of natural selection pressure, must be regarded as rare.” And further, “While [allelopathy] is an attractive concept, there is no certainty that this occurs to any appreciable extent in nature.” (2) These observations are certainly consistent with the reality of the eucalyptus forest in the San Francisco Bay Area, where an understory of both native and non-native plants is often found. If not allelopathy, then what suppresses understory growth? We have hiked as often in oak woodland in California as we have eucalyptus forests. We find the understory in the oak woodland as varied as any eucalyptus forest. Sometimes we don’t find much understory in either type of forest. A redwood forest has the sparsest understory of any of these three tree species. What these forest types have in common is that there is a layer of leaf litter under them that suppresses germination and growth of other plants because it forms a physical barrier to the soil. And the limited sunlight on the floor of both forests is surely a factor in suppressing the development of an understory. When an understory persists through the limiting factors of low light and heavy leaf mulch, there are obviously mitigating factors such as more moisture, better soil, and other resources that understory plants need. Furthermore, some species of native plants seem to be suited to conditions in the eucalyptus forest. 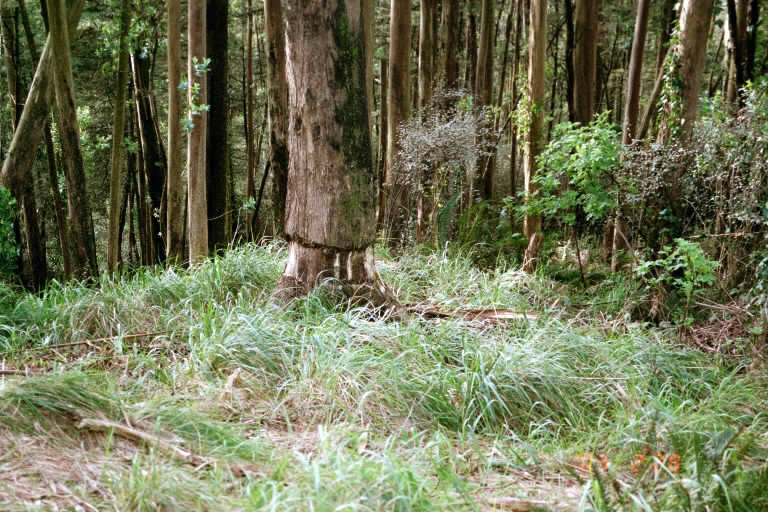 The leaves of eucalyptus contain chemicals–as do the leaves of all plants– but if they do not prevent the growth of an understory or they are not any more likely to suppress the growth of competing plants than chemicals in native tree species, this is not a legitimate argument against eucalyptus. Cal-IPC has not provided any scientific justification for indicting eucalyptus based on its allelopathic properties. (1) Kam Watson, “The Effect of Eucalyptus and Oak Leaf Extracts on California Native Plants,” 2000. I am an Australian and can say categorically that the problem is not allelopathic alone. The problem is poor species choice. The prime issue is the wax content in the leaves which makes them very slow to biodigest (or compost). Moisture unless substantial tends not to penetrate the deep mass of waxy leaves, that gather. On wetter east coast climates this is not so much of an issue but in Mediterranian (west coast) climates, the long hot dry followed by shorter cooler wet season causes issues of leaf litter build up. I have an oak at home in Australia. It by comparison is a treat to grow under as the leaves are thin, wet easily and digest in a few weeks when composted. They also give, light during winter to the soil as they are deciduous. Eucalyts are evergreens. Also the roots of native Aust. eucalypts tend to sequester moisture with upturned feeder roots from inside the drip line. This make lawns or other plants very problematic to grow…. (If you want photos of Turpentine lawn versus non, 50 metres away, talk to me…. Some also have small nuts, they drop….that can be pain. There are some Eucalypts that are way, better than others, in fact they are almost theh perfect tree. Some are truly beautiful, have an open airy light fillled canopy and rarely drop leaves. Plants grow well in close proximity. Their scent in bloom is amazing (feeding your bees, with pesticide free abundant nectar and this is something the US does badly need, given your issues with CCD in the USA) when other plants aren’t flowiern and should definitely be included in any ones perfect garden, anywhere on the planet. Lemon Scented Gum, and others should definitely be taken off the hit list. Thanks, Don. Most of what you say fits with our experience with eucalyptus. The one exception is that in very moist places with a lot of fog we can get substantial understory in our eucalyptus forest.